I read it in the news! Newspapers can be a wonderful source of family history information. Share some aspect about your family history that you learned about in a newspaper. Articles, advertisements, obituaries, classified ads, photos... all are fair game if they appeared in a newspaper. I've written several times in the past about newspaper items. I found out about my great grandfather, Melvin Van Every's, Cheese manufactory in Ancestry.com's newspaper databases. And while I originally found out about my great grandfather, Selig Feinstein's, service to the community in a book, the book cited several newspaper articles that I was able to research on microfilm. I also found out about my grandfather, Melvin Newmark's, participation in the Veterans of Future Wars at Ancestry. Newspaper obituaries have provided the greatest advancements in my family tree, helping me to find the names of distant cousins. Such an obituary led me to 100 Dudelsack cousins back in May. This isn't the death certificate I would get if I ordered it from the State of Missouri. It's from the funeral home. I'm pretty sure it is identical, except for the bottom section which contains the notes for the funeral home. Often the Diagram of the Lot, and the location of the burial, this funeral home inserted a newspaper clipping of the obituary along with the name of the Rabbi who officiated over the funeral. 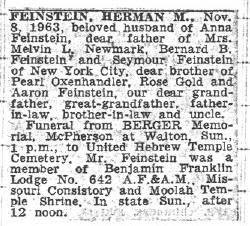 Herman Feinstein died in 1963, so his death certificate won't be available for download from the Missouri State site until 2013. It would cost $13 from the State Vital Records office, and it's not clear they would provide the certificate to a non-immediate family member. 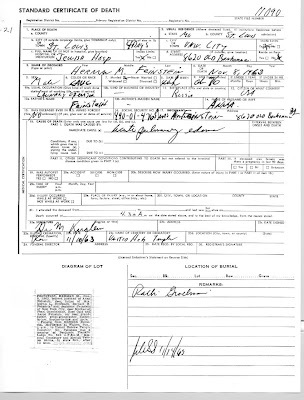 The person who sent me copies of the death certificates, obtained from the funeral home likely at a minimal copying fee, was an independent researcher who was completely unrelated. This is a useful tool to remember when you run across states with heavy restrictions on their copies of the death certificates. If you can find the obituary, it often includes the name of the funeral home. In 1960, Dr. Martin Luther King Jr. was a guest of Rabbi Grollman and members of the congregation. King had just been released from jail and was exhausted prior to his speech to the congregation. He napped in a chair in Rabbi Grollman's study and then gave a passionate speech. Rabbi Grollman never parted with that chair. "He was a passionate civil rights advocate, and participated in so many efforts," recalled the rabbi's second cousin, Bernard Lipnick, rabbi emeritus of B'nai Amoona. "He was very courageous and a disciplined person. He took positions that were not popular with all, such as the state of Israel. He expected Israel to act in moral ethical ways; he did not hesitate to criticize the Israeli government." Every year since I was a toddler, when I've attended High Holy Day services at the synagogue, he would be on the bimah, leading the congregation in prayer. His role has diminished over the years as he was promoted to 'Rabbi Emeritus'. but he has still been there. Last night was the start of Rosh Hashana, and I could feel his absence. He has been a major part of my family's lives for decades. I learned a lot about him from several newspaper obituaries I wish I had known beforehand. In August I enjoyed talking with my parents about their recollections, as they remember King's speech well. I can't use the Gregorian calendar for my great grandmother. She was born on New Year's Day on the Hebrew calendar, but she wasn't sure whether it was 1886 or 1887. If 1886 it would have been September 30th. If 1887 it would have been September 19th. It was the First of Tishrei, though, which once again falls on September 30th this year. I have searched the St. Louis City Birth Registers for September and October from 1885 to 1888. I haven't found her. Her father is supposed to have immigrated to the US in 1885, though his first appearance in the St. Louis City City Directory is 1890. It's possible Bertha was born outside of Missouri (maybe in East St. Louis, IL). Or it's possible the Cruvants just didn't bother to register her birth. I've only found the birth registry of one of her three younger siblings - Sol, the youngest. If the coding explanation is beyond comprehension they have a Preview Wizard that generates a simple script that can be copy and pasted into a blog post or into a webapage. The only thing you need is the BookSearchID which is the alphanumeric code that follows ID= in GoogleBooks search results. When you get most of your news online, like I do, it's easy to miss a local story. Thankfully David at OakvilleBlackWalnut blogged about St. Louis County opening up internet access to marriage records (and property deeds) for a reasonable fee ($5.95 +50 cents/page). Access to the marriage and real estate indexes will be free, and it is supposed to go online October 1st. The newspaper article doesn't state whether there will be any privacy window on the marriage records, or how far back the records go. My beloved Mac iBook which I have had for several years won't boot, I get a folder with a question mark when I try to start up. And while I have followed all the suggestions in the online support documents, I haven't had success. I have scheduled an appointment tomorrow morning with the local Apple Retail Store at their Genius Bar. We'll see how much of a genius the bartender is, and whether or not s/he can get it working without initializing the hard drive. I'm not in horrible shape if all is lost. I would have been in much worse shape a year ago, but my backup system has improved greatly in the last year. I have an external 200gb hard drive -- though the last time I backed up to it was several months ago. But when I did, I backed up everything. I don't have room to save everything there, but I was saving what I consider my most important stuff. My fiction and poetry writing, as well as my family history folders. I was very good at saving new scanned documents immediately to my wristwatch. For some reason though, the last save of my GEDcom was in June. There hasn't been a lot of new people added to the database in these three months, but the work I did adding citations in August would be lost. I think my primary losses will be a few downloads from iTunes, but not many, and I've heard they sometimes allow you to re-download lost items for free. And some personal photographs I took -- though the most important ones I ended up emailing to friends or family so I have at least a reduced-size stored in my Gmail Sent Mail folder. Three years ago, Jonathan Gurwitz at the Jewish World Review suggested the creation of an American Tisha B'Av. The Jewish people set aside one particular day to commemorate the many calamities that have befallen them throughout history. Tisha B'Av is literally the ninth day of the month of Av on the Hebrew calendar. Normally it falls in August. According to tradition, it is the date of the destruction of the First Temple in Jerusalem and the beginning of the Babylonian exile. It is also the date of the destruction of the Second Temple by the Romans and the beginning of the Diaspora. And it is the date of the decree expelling the Jews from Spain in 1492. While traditionally all three of those disasters fell on the same date, other disasters are also mourned on that date. Many consider it inappropriate to create a new day of observance for new disasters, so there is some dispute over the appropriateness of a separate date for Yom HaShoah (Holocaust Remembrance). The human ability to do evil often appears to be unbounded. Our capacity for sorrow, on the other hand, is limited. If we can bind up all the terrible things in life on one single day, the remainder of the year in some sense becomes bearable. There is another possible motive. We owe the dead our reverence — the men and women who perished in burning buildings, the children shot in a gymnasium, the people drowned in the storm. But our grief must not be allowed to consume the rest of our days and immobilize us from the duty to the living. The two American events Gurwitz combines in his article are both recent: 9/11 and Hurricane Katrina. Of course, if one followed the model, several other days could be included in the observance. There are many who would object to the combination of Patriot Day and Pearl Harbor Day, understandably, as both events are still fresh and distinct in our minds. But over time new disasters - natural and man made - are bound to occur. The nation might see the advantages for combining the two, with other events that were just as devastating in their day but have been replaced over time (and sadly forgotten by many) because our capacity for mourning is limited. My own personal preference for the day of choice would be September 1 - since it seems to be roughly in the middle of several of the more prominent disasters. Though there would be advantages to having it in the summer sometime when more older youth are at home with their families. GenealogyBank has announced that their database for the Social Security Death Index is now freely accessible. GenealogyBank has the only SSDI database that is updated weekly. They also provide more information than some other sites, and as I will show below, in some cases, more accurate information. I will compare the results for a great uncle of mine, Israel David Newmark, the youngest brother of my great grandfather Barney Newmark. I will compare GenealogyBank's results with Ancestry/Rootsweb's since that is probably the best known alternative. GenealogyBank's provision of the GPS coordinates is very useful for some mapping software, and they also provide a much more exact description of the location. Both provide the location in the traditional City, County format. However, all four "cities" listed at GenealogyBank are part of the same zip code, and it seems that Ancestry/Rootsweb just lists the first in the series, which isn't necessarily the correct one. Not being exactly sure which of the four cities my great uncle lived in, I verified this with a relative who died in the 63105 zip code. Ancestry/Rootsweb says she lived in St. Louis City, and GenealogyBank says " Saint Louis; Clayton; University City." She lived in Clayton. Furthermore, Ancestry/Rootsweb says that my grandmother, Belle Feinstein Newmark, died in St. Louis, St. Louis, MO. Which most would interpret as St. Louis City, but they would be wrong. No portion of the zip code of her last residence, 63141, is in St. Louis City. GenealogyBank is correct with "Creve Coeur, St. Louis, MO". 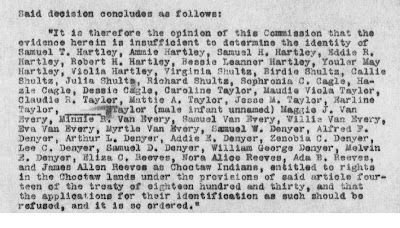 How does Ancestry/Rootsweb get it wrong? I think it may be due to Creve Coeur being part of an unincorporated section of St. Louis County. I also like how GenealogyBank provides the day of the week, and the estimated age at death. Those are nice additions. It should be noted that while in the above example it appears Ancestry/Rootsweb has a location field for "Last Benefit", and GenealogyBank doesn't - when there is data for that field, it is provided at GenealogyBank as well. It's just left out of the results when the information is blank. I start with my great grandparents Herman and Annie (Blatt) Feinstein. The year is 1928, and the location is Cuba. 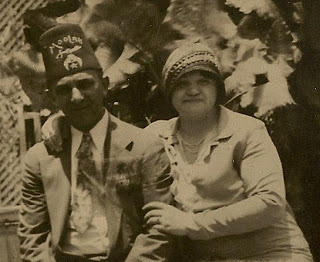 My great-grandfather is wearing a fez with the word "Moolah" on it. As in the Moolah Shriners of the Moolah Shrine Temple. The Shriners is a masonic organization composed solely of master masons. My great grandfather submitted his petition to join the Shriners in December of 1927, so in this photograph he hadn't been a member for very long. He was born in 1886, so he was 42 years old. I don't know how to describe the hat my great grandmother is wearing. Next up are my paternal grandparents, Melvin and Sissie (Feinstein) Newmark. Neither are wearing hats in this picture, nor can you see their hair. That's because both are wearing wigs. (Note: I'm not sure, but a toupee is officially only a partial wig, and I don't think there's anything partial about what my grandfather is wearing.) 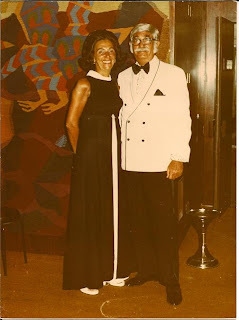 The year is 1975, and my grandmother is 61, and my grandfather 63. 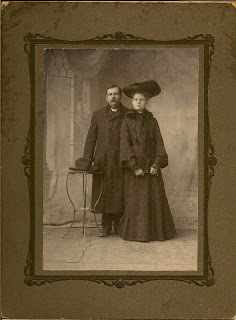 Third up is a photograph of my Great-Grandfather Melvin Van Every and a niece, most likely Mabel Ruth Van Every Creamer. The photograph was taken in 1909. My great grandfather would have been 46, and Mabel would have been 28. My great grandfather has removed his hat, and it sits on the table. Mabel's hat is impressive. 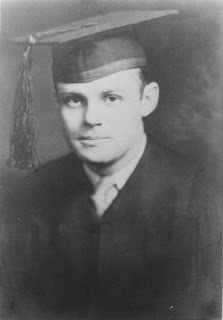 I finish with my maternal grandfather, Martin Deutsch, in a photograph most likely taken in 1931 when he graduated from DePaul University Law School. He would have been 24. It's possible this is his high school graduation, but it is less likely. Thomas MacEntee at Destination: Austin Family has recently been posting daily historical births, marriages, and deaths for his family. I like this idea, however, I'm not confident I can do this daily. A weekly post seems manageable, limited to individuals who are deceased. I thought I could focus my attentions elsewhere, and then Tom Kemp on his GenealogyBank blog says he's a cousin to Alaska Governor, Sarah Palin, and that she is descended from a Rev John Lathrop. I remembered Lathrops interconnecting with the descendants of Rev. Thomas and Katherine Stoughton, of which I am one as well. Kemp provided no links to any sources, so I had to go looking myself, and I didn't find anything I could trust. I found her in the Dowling Family Genealogy at WorldConnect. Dowling doesn't have her descended from the Stoughtons. And I found Dowling's pedigree for my ancestor Samuel Swayze, and our lines as he has them don't seem to intersect. Why don't I trust Tim Dowling's research? I have no idea who he is beyond his heady claim to be related to every single president of the United States. His pedigree for my ancestor Samuel Swayze says that Robert Chamberlain, who married Elizabeth Stoughton, is descended from the first three Kings Henry. Which is all well and good. But William Addams Reitweisner doesn't make the claim that John Kerry is. He provides no known parents for Robert Chamberlain. even though he carries Kerry's other lines a couple more generations. Surely if Reitweisner could find some reliable sources for Chamberlain's parents, he would have. Further, I lack confidence in Dowling's attention to sources, as he often doesn't provide sources, especially with earlier generations. Since I don't trust his claim of Heath's ancestry, and I can't find her genealogy anywhere else, until I do find a source with a little more credibility, I am happy to accept that I might not be related to the Alaskan Governor. Note: I missed a post at GeneaMusings on Friday. Randy linked to Robert Battle's Ahnentafel for Sarah Palin. Battle provides sources, and notably doesn't go any further back than 1600.